Welcome to the Ask Mr. Annuity Website! 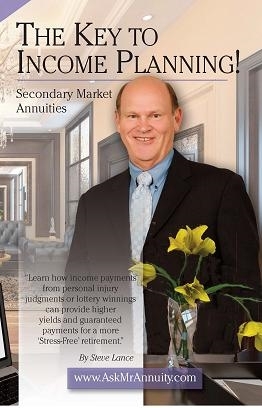 My first book "Annuities: The 21st Century Pension Plan" was written after the stock market crashed in 2008. Retirees lost millions of their savings in the market correction. If they had been in a fixed annuity their money would have been protected. We represent over 25 insurance companies and have directed over $200,000,000 of our clients money to fixed, and indexed annuities for safety, growth, and a pension type income that you can't outlive. We have been in business since 1995. If you worry about market volatility and the potential loss of your savings; if you want a guaranteed return on your money and a guaranteed return of your money then call us for a free consultation. We specialize in 401k rollovers to protect your retirement savings! CLICK HERE TO RESERVE YOUR SEAT AT ONE OF OUR WORKSHOPS! Download our NEW BOOK for free! "HERE"
AskMrAnnuity.com is a comprehensive financial services firm committed to helping our clients improve their long-term financial success. Our customized programs are designed to grow, protect, and conserve our clients’ wealth by delivering an unprecedented level of personalized service and expertise. Since 1985, we have provided innovative solutions to our clients and have shown the ability to be dynamic in an ever changing financial world. Secondary Market Annuities are a little known "safe" opportunity for your portfolio. They can provide income, tax-deferred growth and higher returns than assets in similar classes. Institutional buyers and hedge funds have been the primary buyers of these cases, however, we offer them to private investors. When you purchase structured settlements (SMA's), you are getting the benefit of both "safety" and higher returns. Please consult your attorney or financial professional before purchasing a SMA and review all of the risks associated with the purchase. If you are interested in a SECURE Quote for your Structured Settlement or Annuity Payments, please do not hesitate to call us. Don't settle for a lowball offer from JG Wentworth, Peachtree, or Stone Street. Let AskMrAnnuity help get you the cash you need, today. Thanks for visiting. Please call if we can be of assistance.